Thanks to Trader Joes, cauliflower gnocchi is all the rage right now. I don’t know about you but every time I go to pick up some from the freezer section, they’re sold out! Turns out Trader Joes only gets a limited supply of the cauliflower gnocchi each week. Sooo, we decided to make our own! 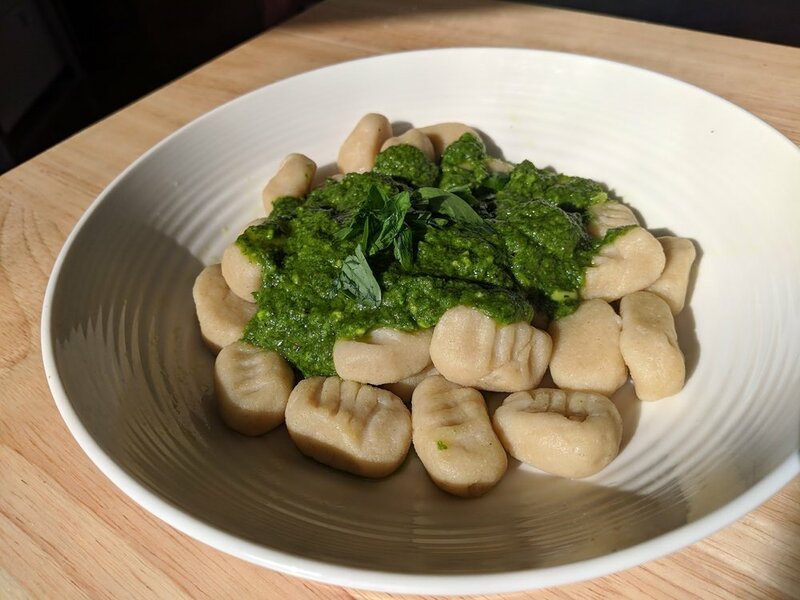 We also created a creamy avocado pesto to top the gnocchi. Pesto, in theory, sounds super healthy and nutritious. The reality is, store bought pesto is loaded with oil and parmesan cheese making it pretty fattening. We are skinny swapping out the cheese for a healthy-fat avocado and adding spinach for more nutritional value in every bite. Steam the cauliflower (we used riced cauliflower that you can steam in the microwave, just to make life easier). In a food processor, combine the cauliflower, the flour, salt and olive oil and blend until a dough consistency forms. If the texture is too goopy, add more flour. Take half an inch of the dough and roll into little gnocchi shape. Press a fork down on it for the pretty little lines. Boil and salt water in a pot and let the gnocchi cook for 3-5 minutes. For the sauce: in a food processor, combine your avocado, basil, olive oil, spinach, salt and pepper until a creamy sauce forms. Top your gnocchi and enjoy!